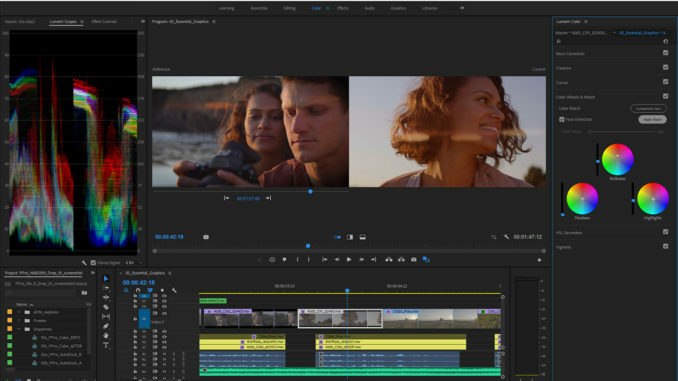 This morning, just prior to the start of the 2018 NAB Show, Adobe announced a major update in Adobe Creative Cloud, giving video professionals new tools to automate and expedite time-consuming production tasks without sacrificing creative control. 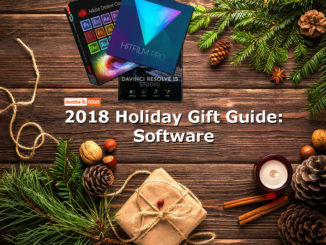 Available today, the updates include powerful new capabilities for refining color, creating graphics and crafting audio, along with enhanced VR tools, improved collaboration, integration with Adobe Stock and advanced artificial intelligence powered by Adobe Sensei. Revolving around the theme of “Powerful Alone. Unstoppable Together,” Adobe updated Premiere Pro, After Effects, Audio, Character Animator, Media Encoder and Adobe Stock. Edit more powerfully with color and light in Premiere Pro CC – Powered by Adobe Sensei, Color Match two shots with one click, applying editable Lumetri adjustments from one clip to another to achieve visual consistency in scenes and across whole projects. Compare shots using the new split-view. Create animation and graphics more quickly in After Effects CC – Stacked behaviors and effects in combination with timeline-based animation now make the creative process more visual and intuitive. Apply changes to individual effects across multiple versions of a composition with a single adjustment using new Master Properties. Also, complex motions can be made to any surface mesh with the new Advanced Puppet tool. 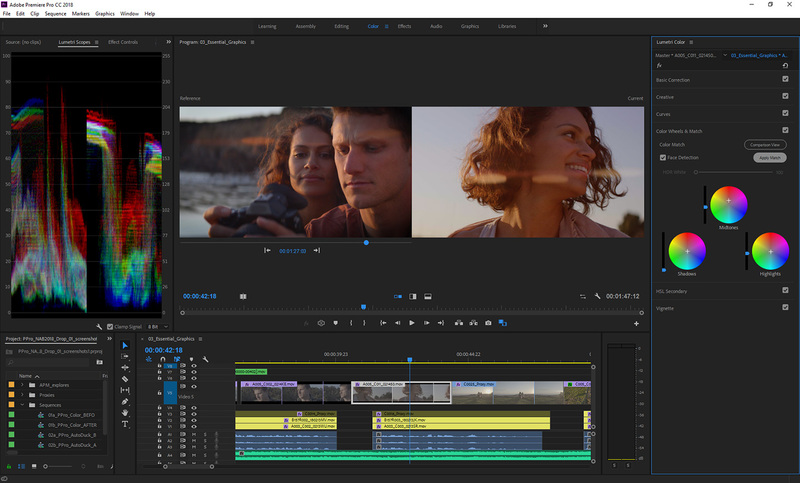 Sound even better with Sensei-powered audio workflows – Automatically adjust soundtrack audio around dialog, whether for a single clip or an entire project, with Sensei-enabled auto-ducking, now available in Adobe Premiere Pro. Bring art to life faster with Character Animator – Animate personas more quickly and efficiently with a library of behaviors and custom triggers. Drag layers from the Puppet panel into the Triggers panel to apply and refine existing behaviors or create new ones with intuitive new drop targets. Add 360 degrees of creativity with improved tools for immersive content – Adobe Immersive Environment is now available in After Effects CC, simplifying the immersive workflow to move more efficiently through clean-up and effects tasks. New support for the Microsoft Windows Mixed Reality platform offers a wider range of headsets to choose the best tools for the job. Collaborate more easily in Team Projects – For the ultimate in project collaboration, real-time presence shows when teammates are online and new badges indicate when a project has been updated. Get content you need with Adobe Stock – With direct access to millions of curated HD and 4K videos, select clips for establishing shots, fill in the final gaps in projects or enrich storytelling with visual variety. Add sophistication and polish to video content with professionally designed Motion Graphics templates, including animated titling and lower thirds graphics with editable effects and text. Learn panel for new users – Premiere Pro beginners now have a place to start with targeted tutorials that guide them through the foundational steps of video editing. The new Learn panel is just a click away whenever it’s needed. Color Match: Speed up your color work by automatically matching shots. Color Match, powered by Adobe Sensei, captures color and light values from a reference image and applies them as editable color adjustments to the current shot. See the changes in the Lumetri color wheels, where you can refine your color corrections and creative grades—or save them as Looks. Face Detection adds even more magic by intelligently adjusting for skin tones in the target image when matching a shot. Split view options: Compare two shots side-by-side or use a wipe slider to see before-and-after color adjustments. Toggle Lumetri color on or off without impacting other effects. Video Limiter: Ensure that your color grading will meet broadcast standards. Work within a defined standard as you edit, or apply Video Limiter parameters to your project on final export. More creative control: The enhanced Essential Graphics panel in Premiere Pro gives you next- generation titling and graphics, using familiar Adobe design tools. Create lower thirds directly in your program monitor; toggle on animation in the Essential Graphics panel to record changes as keyframed motion in your video. Save animations as Motion Graphics templates for re-use or copy them into After Effects compositions for advanced work. More graphics power: Motion Graphic templates provide a vehicle for sharing complex animations with editable parameters as .mogrt files—ideal for branded content or just streamlining graphics workflows. New controls for 2D position, scale, and rotation give you more tools for customizing Motion Graphics templates created in After Effects. You can now update .mogrt files in your sequences with new versions, retaining settings and customizations from the original. Adobe Stock integration: Enrich your storytelling with fresh, cinematic HD and 4K footage and professionally designed Motion Graphics templates from Adobe Stock—right from Premiere Pro. Browse Adobe Stock videos from the Libraries panel to find contemporary, diverse clips that reflect your audiences and strengthen your message. Search and preview Motion Graphics templates from the Essential Graphics panel in Premiere Pro and simply drag the .mogrt files onto the Timeline to add beautiful—and editable—text and graphics into your videos. Auto Ducking: Automatically normalize sound track and dialog and get a professional mix in moments. Now part of the Essential Sound panel in Premiere Pro CC, Auto Ducking leverages Adobe Sensei technologies to create envelopes around dialog and sound effects, intelligently reducing soundtrack volume for those sections. Volume adjustments are keyframed and editable, so it’s easy to fine-tune the mix. 360 degrees of creativity: Create 360 video experiences for your audience using the powerful immersive tools and workflows in Premiere Pro and After Effects, including dedicated transitions, effects, and viewing options that help you master the medium as you explore a new frontier of storytelling. Enhanced Adobe Immersive Environment: Navigate 360 VR space with new controls that let you rotate your view without having to move your head. Floating panels show your position in time and space. Use handset controls to change your orientation or move on the Timeline. Windows Mixed Reality: Use the best headset for the task at hand with new support for the Windows Mixed Reality platform, expanding the range of available head-mounted displays for VR work in Premiere Pro. Streamlined collaboration with Team Projects: Real-time presence shows when teammates are online and new badges indicate when a project has been updated. Read-only access to older versions combined with Team Projects’ robust automatic version tracking and infinite undo make collaborative production simple and seamless. Track different time codes within the same project with the new Time Code panel, including options for displaying IN/OUT, Overall duration, Absolute TC, or Source TC for the current shot Copy & paste sequence markers and retain marker spacing and information, including colors, notes, and durations when moving one or multiple clips. Premiere Pro also adds new format support for camera RAW Sony X-OCN (VENICE), Canon Cinema RAW Light (C200), and RED IPP2. After Effects is the industry standard for professional motion graphics and visual effects. The latest release introduces powerful new features for animation, compositing, and next-generation media, like immersive VR and data-driven graphics. Master Properties: Streamline your motion graphics workflow by creating compositions with Master Properties. Add layer properties, such as position, color or text, in the Essential Graphics panel and control them in the parent composition’s timeline. Use Master Properties to push individual values to all versions of the composition or pull selected changes back to the master. Versioning compositions gives you a more efficient and more powerful production pipeline. Essential Graphics panel: Go beyond text, color and opacity with new tools for adding 2D position, scale, and rotation parameters to layers and effects right in the Essential Graphics panel. Export compositions as customizable Motion Graphics templates that give Premiere Pro editors more creative options within a structured design. Open Motion Graphics templates as a project in After Effects, retaining the composition’s structure and assets. After editing, save the composition as an After Effects project or export as a new Motion Graphics template for Premiere Pro. Advanced Puppet Engine: Take your shape-shifting powers to a new level. Animate layers with precision to create smooth, organic movements, like a fluttering flag, ripples on water, or almost anything else you can imagine. Drop pins to define motions within a dynamic mesh and apply the Starch tool to reduce movement in selected areas with the new Advanced Puppet Engine. 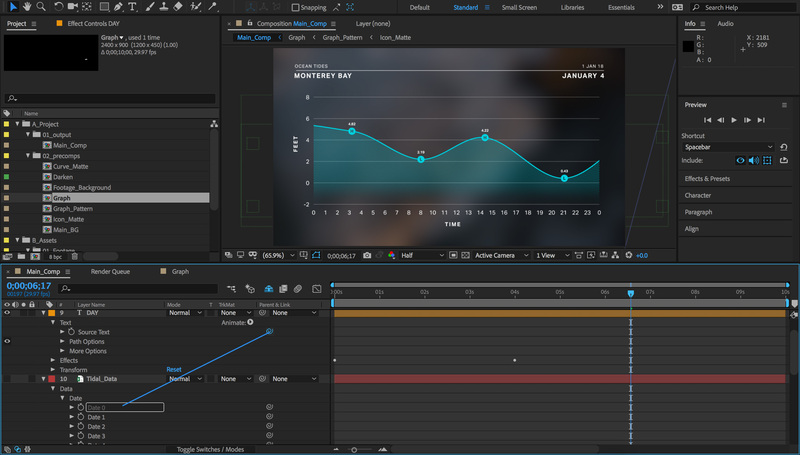 Data-driven animation improvements: Bring data to life in After Effects. Import JSON or CSV data files and view their contents in the Timeline. Drag and drop properties into the composition window to display them as text, or use the Pick Whip to link layer properties to data values. Create reusable graphics that respond to data, and invent new ways of seeing and understanding information. After Effects has helped pave the way for the explosion of immersive VR content, allowing users to work with familiar tools and effects within a new storytelling format. Adobe Immersive Environment: See your content the way the audience will, without leaving the After Effects workspace. First introduced in Premiere Pro, the Adobe Immersive Environment lets you preview your VR content with a head-mounted display, including HTC Vive or Oculus Rift headsets on Mac or Windows. VR Plane to Sphere effect: Transform flat graphics, text and video to 360 spherical format with higher quality for precision VR compositing. Performance & GPU optimizations: Add Grain, Remove Grain and Match Grain effects are now multi-threaded, giving you up to 5x faster performance. Work with larger frames with more efficient GPU memory usage. Small changes that make a difference: The latest release gives you enhanced disk cache management, project organization improvements, and a new shortcut for cycling through mask modes. Mix and edit sound for video, broadcast and podcasts with the most comprehensive end-to-end audio toolset available. The new release introduces a greatly simplified workflow with Premiere Pro projects and brilliant multitrack enhancements. 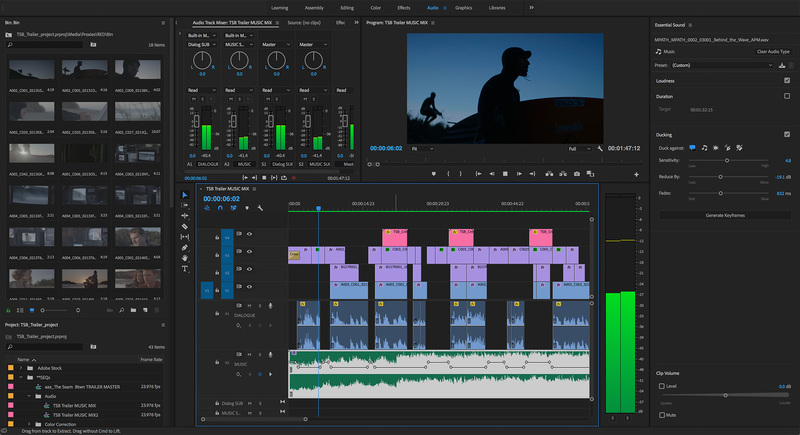 Open Premiere Pro projects in Audition: Sound better faster. 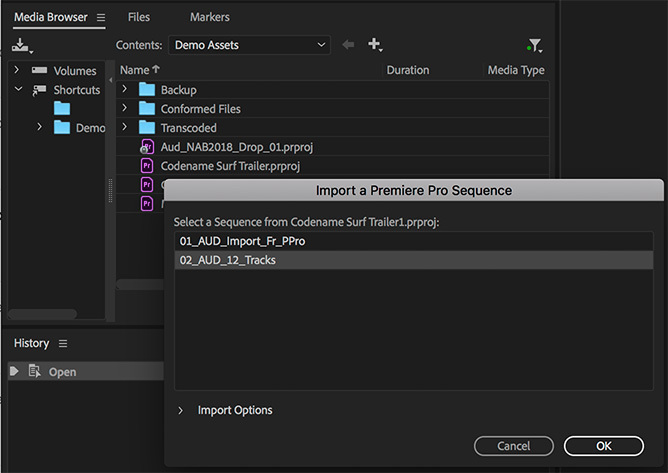 Now you can open native Premiere Pro projects in Audition to select the sequences you want to work on, giving you a simpler, more efficient audio editing workflow. Compound media import: Find the specific files you need. Twirl down compound media files to choose the audio and video tracks you want to work on, or simply import the whole file, including container formats like MXF. Monitor the video stream as you edit the audio in Audition. New Tracks panel: Large multitrack projects are easier to manage and work with in Audition. Use the new Tracks panel to show or hide tracks, or groups of tracks, so you can focus on the parts you want to work on. Create your own preferred track groups and save presets for an efficient, personalized multitrack editing experience. Responsive performance: A little under-the-hood magic gives you smoother scrolling through multitrack projects, and better zooming for going in to see the details or out to see the big picture. Jump to Time: Navigate to any spot in the timeline with this useful keyboard shortcut. Clip Spotting: Video previews in Audition update in real time when new clips are added, moved, or trimmed so you can continue editing with frame-accuracy. Add album art: Creating modern podcasts and albums in Audition just got better. With support for .jpeg and .png files, you can now embed artwork images and thumbnails in your .mp3 files. Run scripts: Browse and run scripts within Audition or via the command line to automate application functions like loudness normalization, QC validation, and others. Streamline common tasks, including third-party integrations, and bring a new level of efficiency to your audio work. Upgrades are available today and included as part of a Creative Cloud subscription. Check out more of Larry Jordan Premiere Pro training here. 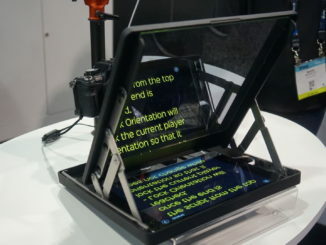 By James DeRuvo (doddleNEWS) Here’s some B-Roll from the two hours I got to spend cruising the NAB Showroom Floor with the Freefly MōVI M5.